Trifle isn't just for Christmas - it's for life. I've actually never had a New Year's Eve without a trifle, and the very sight of one makes me remember what a WONDERFUL world we live in. In fact, I don't know why Louis Armstrong didn't forego all the stupid trees of green and babies crying and start sloshing sherry, custard and hundreds-and-thousands all over the place. That whole song is missing a trick. So, you all know how a trifle goes (despite the many variations of its traditional form) and you probably know a few trifle-with-a-twists - tiramisu trifle, for instance, is epic. My all-time favourite, however, is pina colada trifle. Boozy, creamy and tropical: the perfect party pud. It also just happens to be almost shamefully simple - just make sure you allow yourself a few hours setting time. 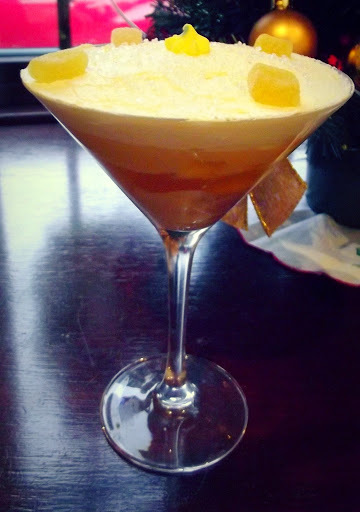 If you have a similar New Year's Trifle tradition, you should definitely serve this with Chilean New Year cocktail Ponche a la Romana: a scoop of pineapple ice cream in a flute of sparkling wine. Why wouldn't you? Serves: One, ideally. Oh alright, about 8. Break the trifle sponge into chunks and layer the bottle of a large glass serving bowl. Drizzle over about 70ml of the Malibu. Drain the pineapple chunks and layer over the sponge. Make up the jelly according to the instructions. When cooled, pour over the pineapple and sponge. Pop it in the fridge for a few hours/overnight to set. In a jug, mix together the sugar, custard powder, and about two splashes of milk until it forms a little paste. Give the coconut milk a good shake before you open the tin - it often has a huge solid lump at the top otherwise! Then mix the whole tin and the remainder of the milk together in a large jug and pour in the custard paste and the rest of the Malibu. Give it a good stir. Pop it in the microwave for two minutes at a time until it starts to thicken (it really varies, but my 850w microwave took 8-10 minutes), pausing every two minutes to stir the mixture. When thick enough (I'd say a teensy bit thicker than the Ambrosia stuff you get) carefully sit the jug in a washing-up bowl of cold water and stir the custard until it thickens and is nice and cool (the water just speeds up the cooling time). Spoon it over the jelly, and pop it back in the fridge for at least another couple of hours until the custard has set. Empty the cream into a large bowl, add the vanilla essence, and whip until firm. Spoon it over the custard, and decorate as you see fit. I've tried dried pineapple and dessicated coconut, but I prefer good old-fashioned sprinkles. *Jelly tip! Not many supermarkets do pineapple jelly - I found mine in ASDA in the World Foods aisle. If you can't get your hands on it, mango or orange jelly is fine, or you can make your own using water, pineapple juice, sugar and gelatine leaves - but I wanted this to be cheaty to give you more time getting tipsy. If you're really feeling lazy (ahem, I've done this more than once), you can get Hartley's pineapple chunks set in pineapple jelly from the baking aisle of most supermarkets - just spoon it straight over the sponge.